The work presents complex methods of simultaneous registration of electric activity of the lower extremity muscles and efforts developed in the process of jumping test performance to exhaustion with revealing structural changes of muscles, their capillaries and other energy supply elements. Methodology reveals inborn predisposition of the system of execution and management of locomotion to loads of different character as well as the level of neuromuscular system reserve capacities in the process of long-term adaptation to physical loads. 1. Bosko C., Luhtanen P., Komi P.V. A simple method for measurement of mechanical power in jumping. European Journal of Applied Physiology. 1983; 50: 273-282. 2. Enoka R.M., Gandevia S.C. Neural changes associated with training. Journal of Applied Physiology. 2006; 101(4): 109-110. 3. Enoka R.M., Douchateau J. Muscle fatigue: what, why and how it influences muscle function. J. Physiol.. 2008; 1, 586(1): 11-23. 4. Fitts R.H. The cross -bridge cycle and skeletal muscle fatigue. J. Appl. Physiol. 2004; 104: 551-558. 5. Granit R. The basis of motor control: integrating the activity of muscles, alpha and gamma motoneurons and their leading control systems. London and New York. Academic Press. 1970; 346 p.
7. Mishchenko V.S. The physiological monitoring of sports training: current approaches and areas for improvement. The science in Olympic sports. Kiev. No.1 (6). (1997): 92-103. 8. Nahdiya A. Prediction of Vertical Jump Height from Anthropometric Factors in Male and Female Martial Arts Athletes. Malays J Med Sci. 2013; 20: 39–45. 9. Radzievskii A., Pryimakov A., Oleshko V., Yaschanin Accumulation, spending and redistribution of functional reserves in the body. Science in Olympic sports. Kiev. No. 2 (2002): 110-119. 10. Dalui R., Singha Roy A., Kalinski M., Bandyopadhyay A. Relations hip of Vertical Jump Test with Anthropometric Parameters and Body Composition in University Students – a Gender Variation. Centr. Eur J Sport Sci and Med. 2014; 5 (1) 83–90. 11. Shchegolkov A.N. Pryimakov A.A., Pilashevich A.A. Sports complex methodology of diagnosis and screening. Scientific and methodological support system of qualified athletes and sports reserves. Moscow. TSNIIFK. 1990; Part 2: 409-410. 13. Tucker W.S., Bruenger A.J., Doster C.M., Hoffmeyer D.R. Scapular muscle activity in overhead and nonoverhead athletes during closed chain exercises. 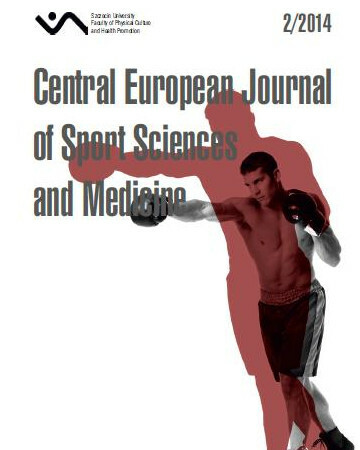 Clinical Journal of Sport Medicine. 2011; 21(5): 405-410.